Alvin 6855/B-XO-8 - Alva-Line Tracing Paper with Title Block and Border 10-Sheet Pack 24" x 36"
Alvin Alva-Line Tracing Paper with Title Block and Border 10-Sheet Pack 24" x 36"
Alva-Line Series 6855 is a medium weight 16 lb. basis vellum paper manufactured from 100% new cotton rag fibers with a non-fading blue-white tint. Finely grained surface that is excellent for pencil and pen receptivity. Pre-printed title block and border with non-repro grids. 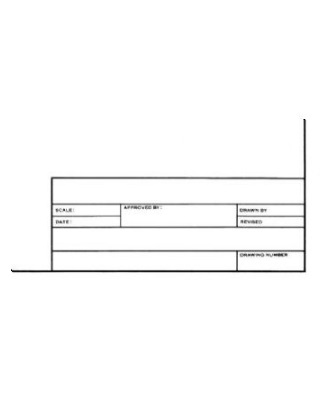 Alvin 6855/B-XO-1 - Alva-Line Tracing Paper with Title Block and Border 10-Sheet Pack 8 1/2" x 11"
Alvin 6855/B-XO-5 - Alva-Line Tracing Paper with Title Block and Border 10-Sheet Pack 17" x 22"
Alvin 6855/B-XO-6 - Alva-Line Tracing Paper with Title Block and Border 10-Sheet Pack 18" x 24"
Alvin 6855/B-XO-7 - Alva-Line Tracing Paper with Title Block and Border 10-Sheet Pack 22" x 34"